Yep, you read it right. I started this way back in the hospital, since a) we had received Evie's MRI records, and b) we finally figured out the hospital had wi-fi. Primarily, it's to maybe explain "why Evie had brain surgery when she was 2 days old." The picture on the left is from just before she went into surgery (11-May-2007); the picture on the right was from about a month ago, when we were in the hospital (24-Jul-2007). Looking at the left picture, it doesn't take a brain surgeon to see (pun intended) - "somethin' ain't right". The white part is all water, either enclosed in cysts (choroid plexus cysts on the sides, and an arachnoid cyst in the middle) or built up in her ventricles (causing hydrocephalus), because the cysts were "blocking the drain". It's hard to see the "dividing line" of some of the cysts, but if you look close, they can be seen. The grey matter is .... grey matter. ;-) Seriously, that's "good brain tissue". 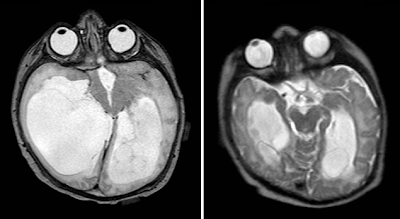 Thus the impetus for surgery can be seen - if you look close around the rim of the cysts - especially on the left side (actually the right side of her head - MRI images are flipped) - you can see a very thin, grey strip. That's compressed brain tissue. Ouch. As discussed back in Evelyn's Story (The Longest Week), the surgery was an endoscopic fenestration of the cysts - in short, going in with a small cable, and popping them like water balloons. This would allow the cysts to drain, and when they drained, they would also begin to stop "blocking the drain" for the rest of the ventricular system. A reservoir was placed to collect any fluid if it did continue to build, in place of a shunt (a more permanent device that can have complications). As can can be seen on the right - things have progressed very nicely since the surgery! The cysts have shrunk in size, "unclogging the drain", and brain tissue is growing & expanding. Yay!